The Tommies finished the season ranked #7 in the country after losing in overtime to East Texas Baptist in the sweet 16. The Ladies finished the season with an overall record of 27-3. St. Thomas beat Chapman College out of California in the first round of the NCAA tournament 81-51. In the 2nd round, the Tommies ended Chicago University’s season with a 68-62 victory. In a hotly contested game with East Texas Baptist, the Tommies came up short and lost in overtime by a 61-58 margin. The Tommies finished a perfect 18-0 in conference play again this season. St. Thomas has won 54 consecutive games against conference opponents. They are the first team in the history of the conference to go back to back seasons without a loss. The seniors finish their conference career with a record of 78-2! 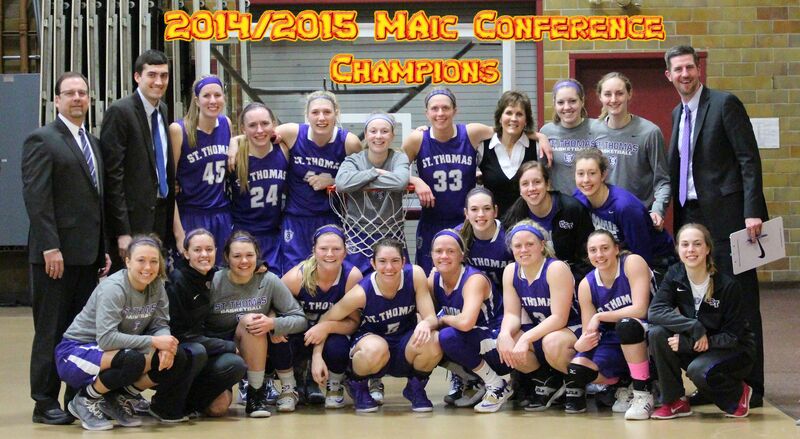 St. Thomas beat Gustavus in the M.I.A.C. playoff championship to earn the automatic bid to the N.C.A.A. national tournament for the 7th straight season. No College Level Women’s Team in the State of Minnesota has won more games than St. Thomas in that time period. The Tommies have earned the MIAC Automatic Bid to the NCAA Tournament for 7 consecutive seasons and 8 out of the last 9 seasons. The University of St. Thomas finished the 2016-2017 season with a 31-1 record after falling to Tufts in the D3 Final 4. It was a heartbreaking loss coming within one game of the National Championship. In a hard fought battle the Tommies came up short missing a 3 point attempt at the buzzer to tie the game. All American Kaitlin Langer finished with 20 points and 20 rebounds! The Tommies finished the season ranked number 3 in the country. A great honor finishing 3rd out of 435 teams. 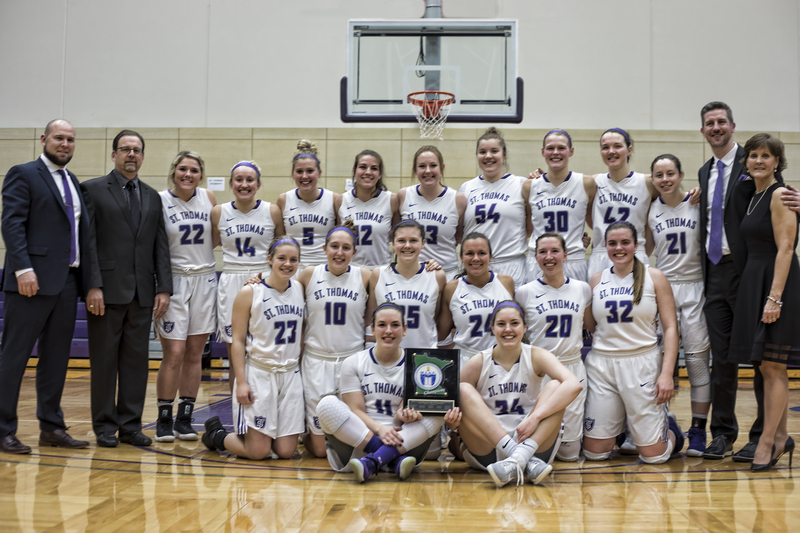 The University of St. Thomas defeated Whitman College 65-48 to advance to the DIII Final Four On March 17, at Calvin College in Grand Rapids, Michigan. The 2nd ranked Tommies 31-0 on the season will take on 4th ranked Tufts 29-2. Kaitlin Langer leads the way once again for the Tommies in the victory over Whitman. Langer pulled down 19 rebounds and scored 18 points in the victory. Lucia Renikof provided some stellar outside shooting adding 14 points in the victory. The Tommies last appeared in the Final 4 in 2012. That year they won a 3rd place game and finished ranked 3rd in the Nation. The Tommies battled back from 6 points down, their biggest deficit in the 4th quarter this season, to beat Marymount in the sweet 16. It was a hard fought battle with the home team moving into the Elite 8 game vs. Whitman. The season started with 435 teams playing DIII Basketball and they are now down to just 8 teams left. The 30 – 0 Tommies are making their 3rd appearance in the Elite 8 over the past 6 seasons. The winner will move on to the Final 4 which will be held at Calvin College in Michigan, March 17 & 18. The Tommies are 49-1 over their last 50 games played. The Tommies had their hands full with a determined Chicago Team that defeated 8th ranked Wartburg the night before. St. Thomas kept their composure and took control of the game midway through the 4th quarter building a 9 point lead. Maddie Wolkow had an outstanding game in propelling the Tommies into the round of 16. The University of St. Thomas came out red hot in their opening NCAA game vs. Superior. The Tommies lead 23-10 after the 1st quarter and exploded for 27 more in the 2nd quarter while holding Superior to one lone field goal in the process to take a commanding 50 -13 lead into halftime. The Tommies never looked back as they cruised to the opening round victory. Lauren Fisher finished with 23 points on 7 of 9 shooting from the 3 point range. It was a new St. Thomas record for most 3 point shots made in a game by a single player. With the victory, the Tommies advance to the round of 32 and host Chicago University at 7:00 pm Saturday evening March 4. 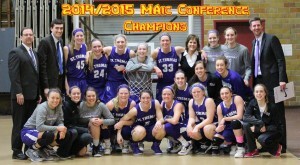 St. Thomas defeated Gustavus College in the championship game of the MIAC playoffs 66-49. It is the 6th straight Tournament Championship. 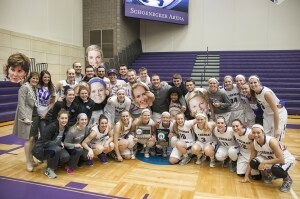 No other team in the history of the MIAC Playoffs, Women’s or Men’s, have won it 6 consecutive seasons! The 27-0 Tommies dominated the game from start to finish with yet another strong performance from All-American Kaitlin Langer. Kaitlin finished with 29 points 9 rebounds and 3 blocked shots. With the victory, the Tommies received the automatic bid to the NCAA National Tournament. St. Thomas beat 4th seed St Bens 75-52 in the semi-final round of the conference playoffs. 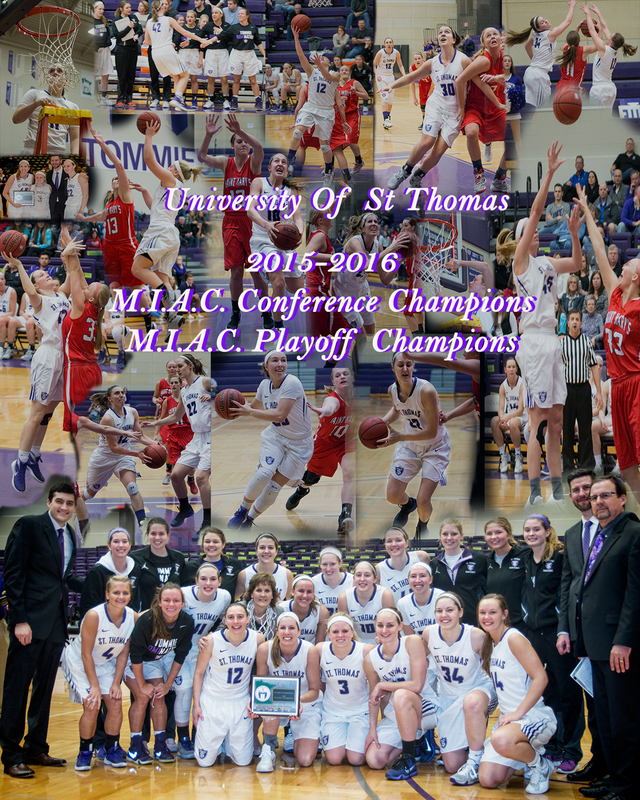 The University of St. Thomas completed their regular season with a perfect 25-0 record. They were undefeated in the M.I.A.C. for the 3rd time in the past 6 seasons. No other team in the M.I.A.C. has gone undefeated that many times in the history of the conference. Kaitlin Langer, the 6-2′ senior leads the Tommies in the 2016-2017 season. She scored over 500 points and had 17 double-doubles in her junior season. She was honored as the M.I.A.C player of the year. She was named the Western Region player of the year and was also named a W.B.C.A. All – American, one of only 10 players to receive the honor throughout the country. She was the 5th St. Thomas player over the last 5 season to receive All-American or honorable mention All-American status. It’s an impressive honor for the University of St. Thomas Women’s Program. 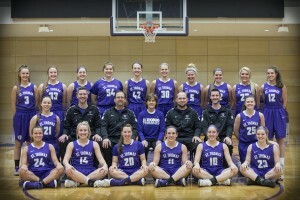 The Tommie Women proudly defended their conference title finishing 16-2 in conference play this season. They also won their 5th straight M.I.A.C. Tournament to claim an automatic bid to the 2016 N.C.A.A. national tournament. The only team to defeat St. Thomas in the 2014- 2015 season was recently stripped of their 2015 National Title Crown for NCAA violations. They defeated St. Thomas in the Elite 8 game in the NCAA tournament. 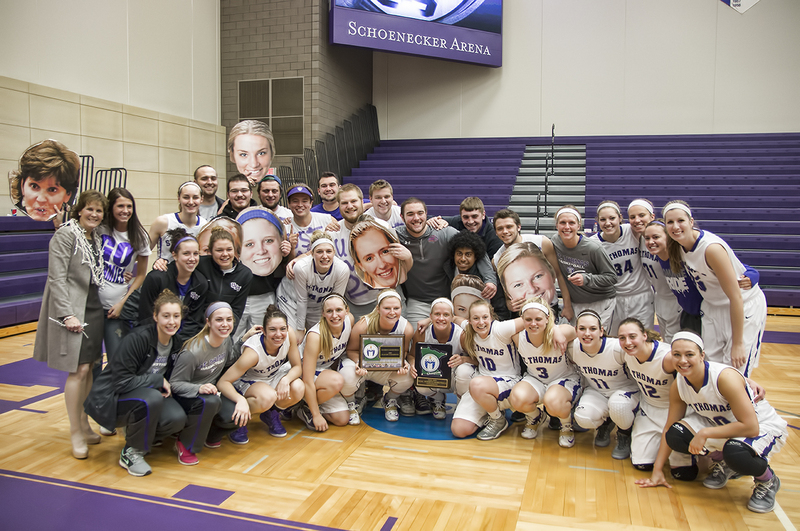 The University of St. Thomas finished the regular season with an 81-47 victory over Hamline giving Coach Sinn her 500th career coaching victory. Her coaching victories are a combination of high school and collegiate coaching wins. The Lady Tommies traveled across the ocean to Spain this past August to play international competition. The trip included great sightseeing and 3 basketball games. The Tommies finished 3-0 on their trip capped off by defeating a Spain semi-pro team in their final game. It was a great tune-up for their 2014-2015 season. 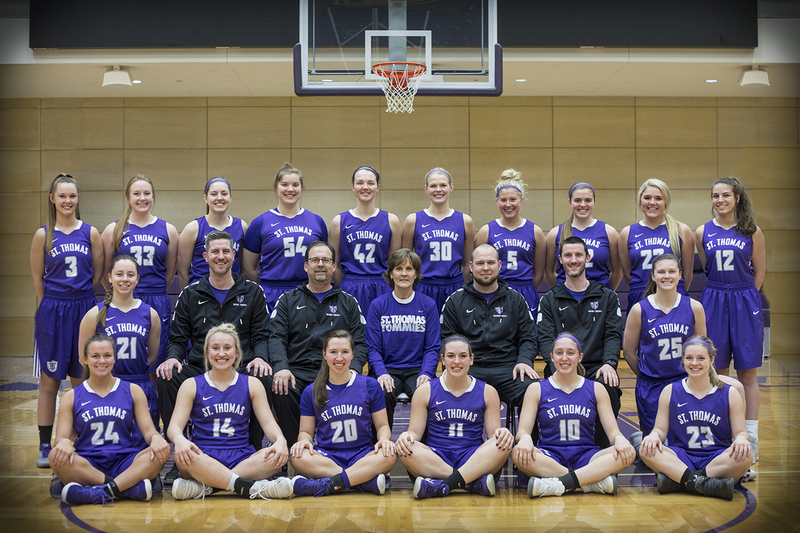 St. Thomas Tops In Women’s Hoops!